So far, our Photographing the Tried and True Sheets series has explored how best to capture photographs of various plants, including trees, flowers and fruits. You can read part one here and part two here! Part three of the series takes a closer look at creating striking visuals for bark and foliage. Branches, twigs and stems, with their horizontal and vertical habits and three-dimensional mass, bring form to the garden. Flowers mostly add color. Foliage and bark provide the texture. The size, shape, color and sheen of leaves and the play of light and shadow are all important considerations in landscape design. Unlike the macro images of flowers and fruits in the Tried and True Plant fact sheets, not all foliage was captured in close-ups, although we did try to zoom in on leaves that perform as ground covers like the Quarry Shade Garden’s Pachysandra procumbens. (This southern native is a good alternative to Japanese pachysandra, which is commonly used in residential landscapes and has become invasive in Virginia.) For ferns, we try to show examples of both fertile and sterile fronds, like those of Matteuccia struthiopteris at the National Arboretum. And, for trees, we provide close-ups of distinctive foliage, such as the feathery leaves—along with its leathery cones—of Taxodium distichum at Meadowlark Botanical Gardens. Additionally, we picture foliage that provides lovely fall color. These images are probably the least representative because color can be highly variable year to year. The weather, especially temperature and moisture, prior to and during the decline of leaf chlorophyll, affects the intensity and brilliance of leaf color each season. Also, some species produce a range of fall color so, despite the weather, the fall foliage of some of its trees incline toward attractive shades, while others tend toward the mundane. Furthermore, the location of the plant—in sun or shade—may affect color. An example is Glencarlyn’s Fothergilla gardenii. The two pictures of the same shrub — one on its sunny side (crimson and burgundy) and the other on its shady side (more orange and yellow than red) — were taken just minutes apart. Lastly, timing is everything: Trees can be garbed in leaves of peak color one day and, after a wind or rain storm, be bare the next. And, speaking of bare, this is when deciduous shrubs and trees show off their bark—smooth, furrowed, peeling, shiny, colorful, mottled, or striped. Sometimes this aesthetic feature is overlooked in landscape planning even though it is especially important in a winter environment in the absence of other elements. Where we think it adds interest, we include bark images, even for some evergreens. For example, the image of the ridged and furrowed trunk of Pinus strobus in Fairlington also does double duty in showing the structure of the branches. 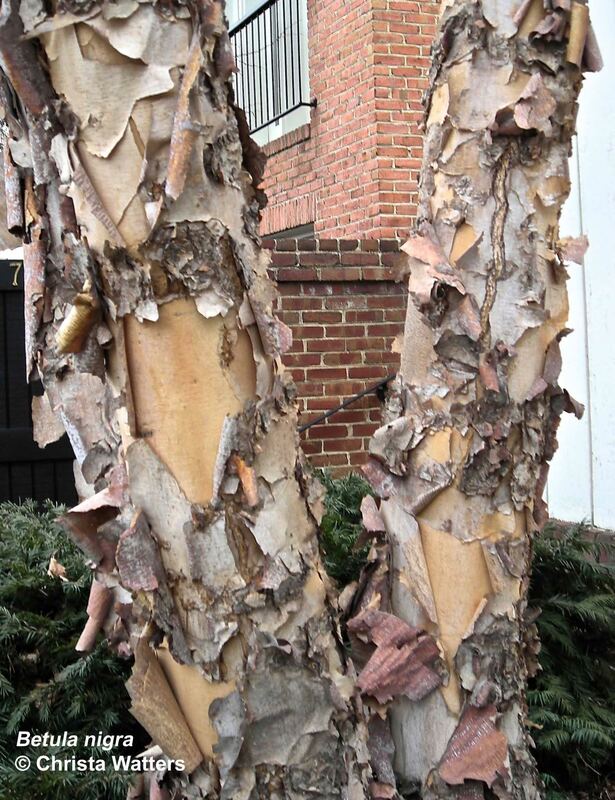 For Betula nigra, we provide two examples: a younger tree with papery, exfoliating bark on a private property in Alexandria and a more mature tree trunk with coarse scales in Meadowlark Botanical Gardens. In 2015, we will continue our search—winter, spring, summer and fall—for local Tried and True specimens to improve the quality of images in the fact sheets. As we take time to photograph plants and observe closely their attributes, the more we appreciate the special qualities that native plants add to the landscape. This entry was posted in Community Gardens, Demonstration Gardens, Glencarlyn Library Community Garden, MG in the Garden, Public Education and tagged Alexandria, Arlington, bark, Betula nigra, decidouous shrubs, deciduous, deciduous trees, Fairlington, fall color, ferns, Flower, foliage, Fothergilla gardenii, fruits, Glencarlyn Community Library Garden, Glencarlyn Library, Japanese pachysandra, leaf chlorophyll, leaves, Master Gardeners of Northern Virginia, Matteuccia struthiopteris, Meadowlark Botanical Gardens, MGNV, MGNV Sunny Garden, National Arboretum, Native plants, non-natives, Pachysandra procumbens, photographing plants, Pinus strobus, Taxodium distichum, Tried and True Native Plant Selections for the Mid-Atlantic. Bookmark the permalink.